Katie Kazmierski in KNOM’s Studio A. Photo: Emily Hofstaedter, KNOM. 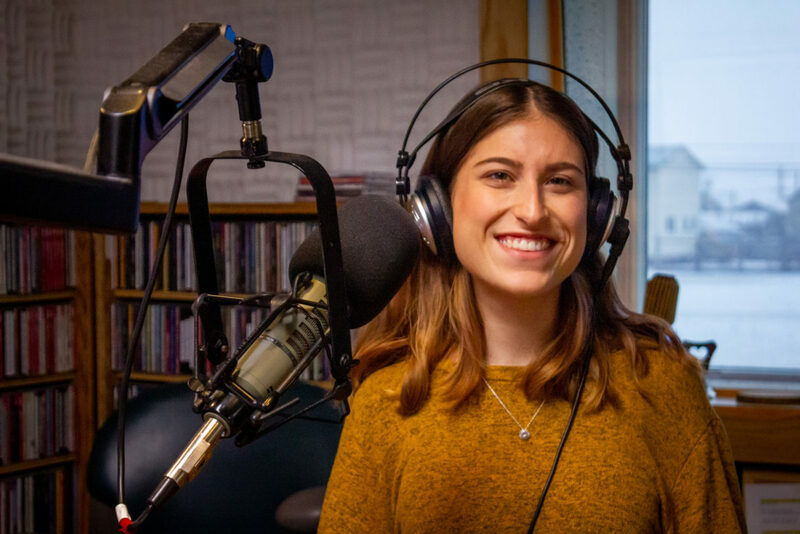 Katie Kazmierski brings to her role at KNOM Radio a strong background in communications — along with a deep appreciation for the richness of different cultures. She’s from the central New Jersey city of Manalapan — a place she misses for its exceptional “bagels and pizza,” she says. At Maryland’s Loyola University, Katie majored in global studies with a minor in communications, specializing in journalism. Her studies of the globe weren’t limited to the confines of Loyola’s lecture halls: she spent a semester in South Africa in 2016 during a study-abroad semester at the University of Cape Town. WLOY, as it turned out, was a springboard to KNOM in more ways than one. In addition to giving her an ample broadcasting skill-set to take to Alaska, Katie’s tenure at WLOY also introduced her to the KNOM program in the first place, via an email forward from her then-supervisor. With extra encouragement from KNOM and Loyola alumna Jenn Ruckel — who “sold me on the experience,” Katie says — Katie applied and soon found herself in Nome. “It really does feel like fate,” says Katie about her move to the Great Land and her work at KNOM. “I don’t think I’d ever get the level of radio experience I’m getting here back home, just starting out.” As for the remainder of her service term in Nome, Katie says “I can only imagine what the next year will have in store for me… Nome continuously surprises me, so I’ve learned to not have expectations and just roll with it.” Katie constantly brings that sense of eager curiosity and discovery to her work, deejaying in the afternoons and on Saturdays and bringing timely, unique stories to listeners during weekday newscasts — and on this website. “I hope that I produce stories and spots that I’m proud of here and continue to make meaningful connections in the community,” she says. When not at work, Katie says she enjoys journaling, watching movies, cooking and baking, and photography. She’s also finding Nome an ideal place for catching stunning sunrises and sunsets, especially from the shores of the Bering Sea, as well as live performances of local musicians.